My planty pics from a few days ago, highlighted the gorgeous violas, or wee pansies, or whatever they are (they’re in the same family, no? ), that I picked up at the nursery. 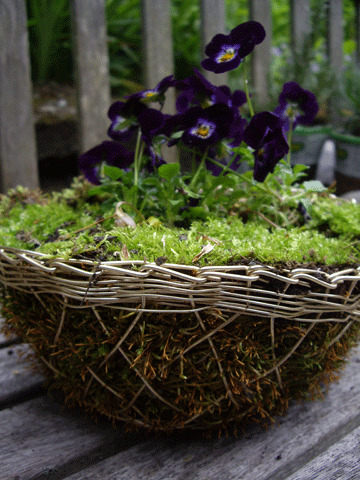 Clara and I decided they would look lovely with some moss, so we went out and foraged for some and lined this little wire basket that i found in the attic. 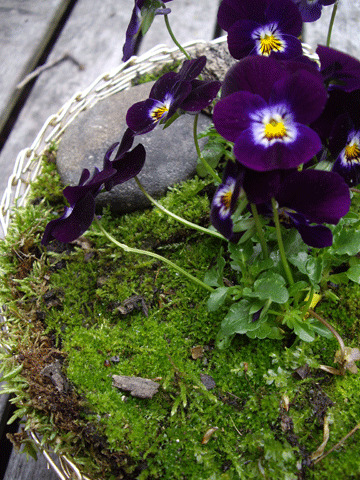 I love the deep purple with the moss. Who doesn’t love moss, really. There is alot of it in our shady backyard and the woods behind our house, and Clara likes to lay down on it and pretend it is a fairy bed. Very cute. It also makes a very snug resting spot for her favorite stuffed kitty cat. While I was sorting through my bookmarks awhile back, I found this idea for moss graffiti. Kind of clever. 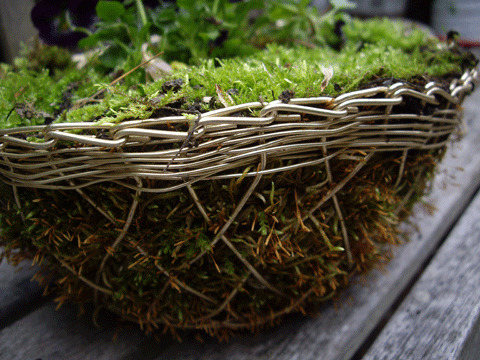 I need to plaster my pots with that recipe, so they get some nice mossy growth.